BRIGHTON, Mich. April 9, 2012 – We took the 2012 Ford Edge out to grab some lunch at the Green Oaks Village Place mall at Buffalo Wild Wings and to watch the start of the Detroit Tigers 2012 opening game. The 2012 Edge had all of the great features you could want in your Ford. The Edge has “his and hers” seat setting preferences. With just the click of a button your seat moves into that “just right” setting you saved it to, perfect for families that share vehicles. This 2012 Edge, like many of our great New Ford Vehicles at Brighton Ford came with SYNC technology. With a click of a button on the steering wheel and a voice command we had the ball game playing on the radio without ever taking a hand off the wheel. Being a passenger in the 2012 Edge was just as much fun as driving it! The interior was very spacious in both the passenger seat and in the second row. The best part about being a passenger in the Ford Edge was leaning the seat back to enjoy the view out of the beautiful panoramic moon roof. The automatic lift gate on the trunk is a huge help for those trips from the grocery store where you don’t have a hand to close the trunk. This feature also comes in handy if your heading to the golf course with your friends, and there is more than enough room for everyone’s clubs in the trunk. 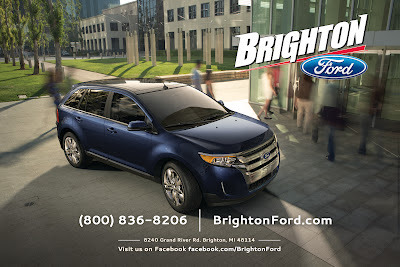 The 2012 Ford Edge is also a great family vehicle. Drivers with younger children can take comfort in knowing that the Ford Edge met or exceeded the IIHS safety standards in ALL categories. And speaking of safety, the back-up camera makes backing out of a tight parking space with limited visibility safer and easier than ever. If any object is behind the Edge before it backs out or while the vehicle is in motion an alarm will sounds letting you know something is in your path.